Osteopathic equine therapy is a trademark protected training and treatment concept, which is based on osteopathy, physiotherapy and therapeutic training. The main emphasis of osteopathy is to improve the mobility of the different structures such as joints, muscles, fasciae and skin, etc. 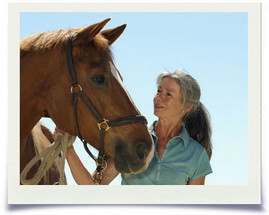 An equine physiotherapist can help when a horse has lost its equilibrium, by working on its bone structure as well as its muscles, tendons and ligaments, using various techniques. A dignified and respectful way with animals is characteristic of my work. During training, I place great importance on practical work. Fifty to 60 horses are available for practical work, which means that the training units do not become too burdensome for individual horses. The variety of different breeds, ages and uses allows the demonstration of a wide spectrum of practical problems and their treatment as case examples. My intention is to train therapists to be able to identify and correct unreasonable demands on the horse as well as wasteful movements. Insubordination and loss of performance have to be recognized and solved in a way which is fair to the horse.